We’re nearing the end of the fireplace project. Next up: tiling. 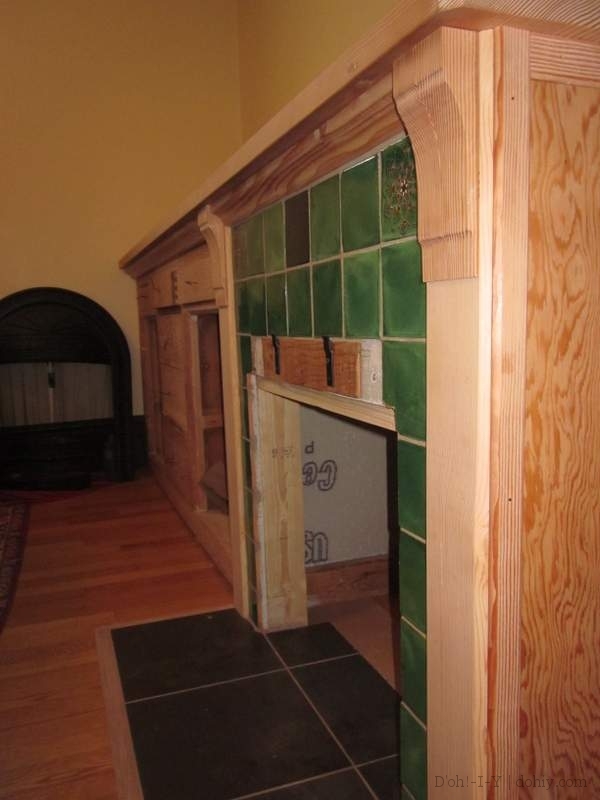 There were two areas to tile for this project–the vertical fireplace tile around the surround, and the hearth tiling for the floor in front of the fireplace. After some hunting, we found tiles for the area around the fireplace. 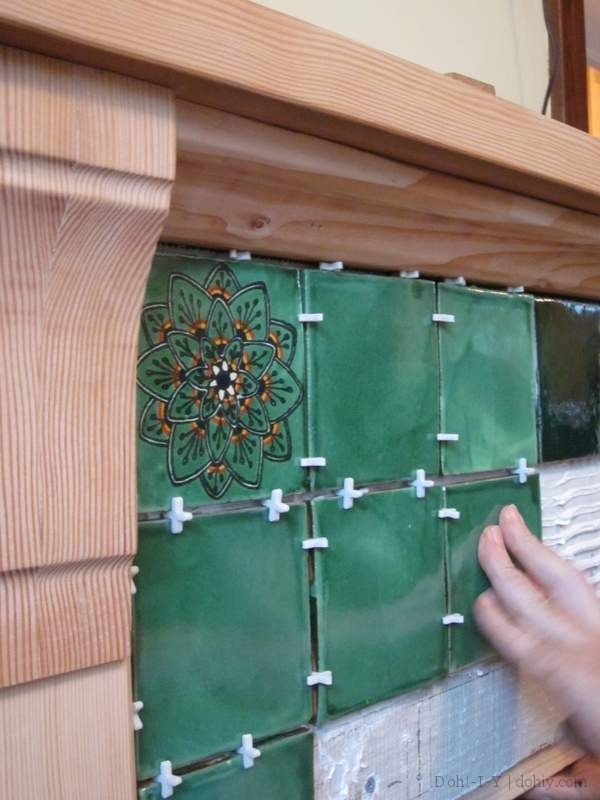 These are the hand-made Mexican tiles that we chose for the fireplace. We opted for these Mexican tiles after being uninspired by all the displays in all the ceramic tile outlets in the metro area. Because these tiles are handmade, no two are exactly alike, and they are neither flat nor perfectly square. The hand-hewn look was just what we were seeking for this project. Applying these tiles to the tile base works the same as for any tile. To add a little decoration, we used floral tiles in the top corners, and a darker green tile in the middle at the top. 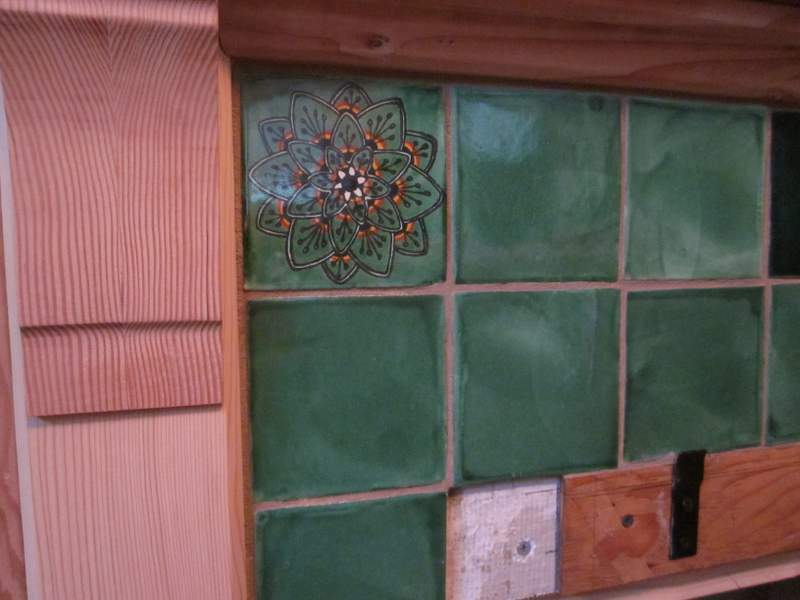 We only needed to tile the area that would be visible around the fireplace, but I tiled a complete row beneath the top row because we had the tiles, and I said that I thought it might help keep the top row straight and in line. But I was probably obsessing a bit. Note the black fire surround attachment bracket at the bottom right. 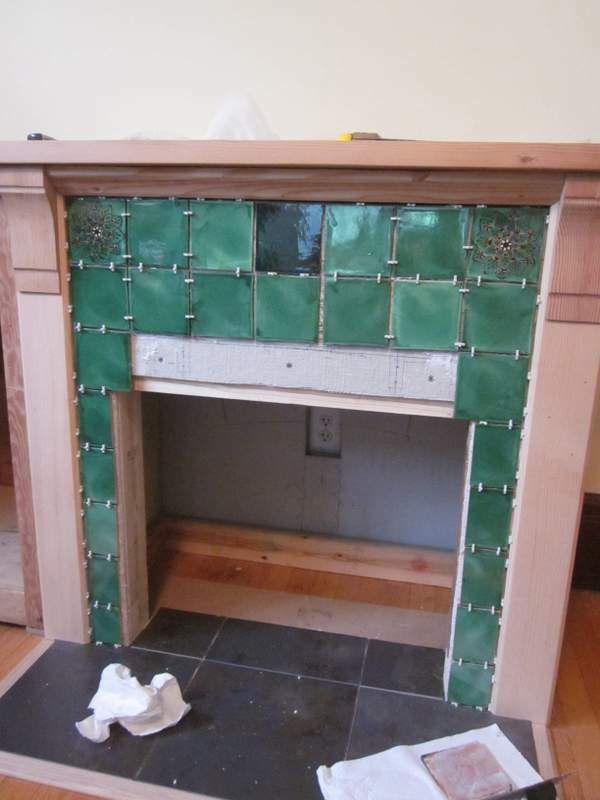 We finished the fireplace tile with a regular tan-colored sanded grout. Originally we were going to use gray, but the warmer tone just looked better with everything else. Of course, every fireplace needs a hearth. One of the things we had in mind for this project was that we didn’t want to destroy any of the existing room elements. We wanted to keep the hardwood floor in good condition, and didn’t want to put fasteners into it. So the hearth had to be freestanding. We made a floating, hardboard base to stick the tiles on. 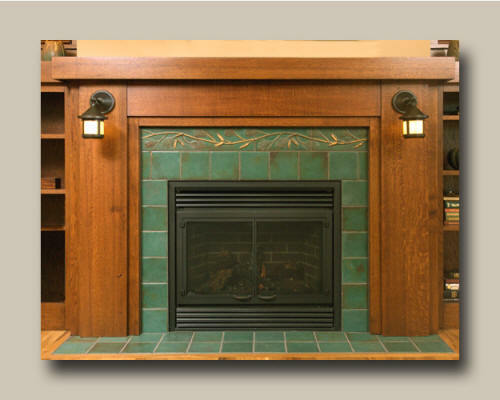 To prevent the hearth from moving, it was cut out to fit tightly around the bottom of the fire-surround frame in an “I” shape so that it could not scoot around. For the hearth tile, we liked the appearance of slate, but for ease of cleaning, we used porcelain tiles rather than actual low-grade metamorphic rock. 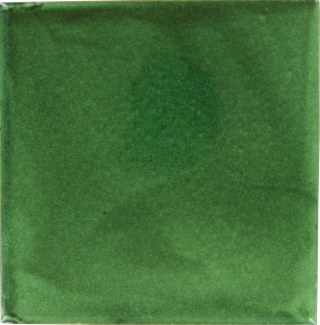 We found 12″ square slate-look tiles at Lowes. We liked these tiles because they matched the metal fire surround, and were neutral. We used regular tile adhesive to stick the tiles down to the hardboard base. 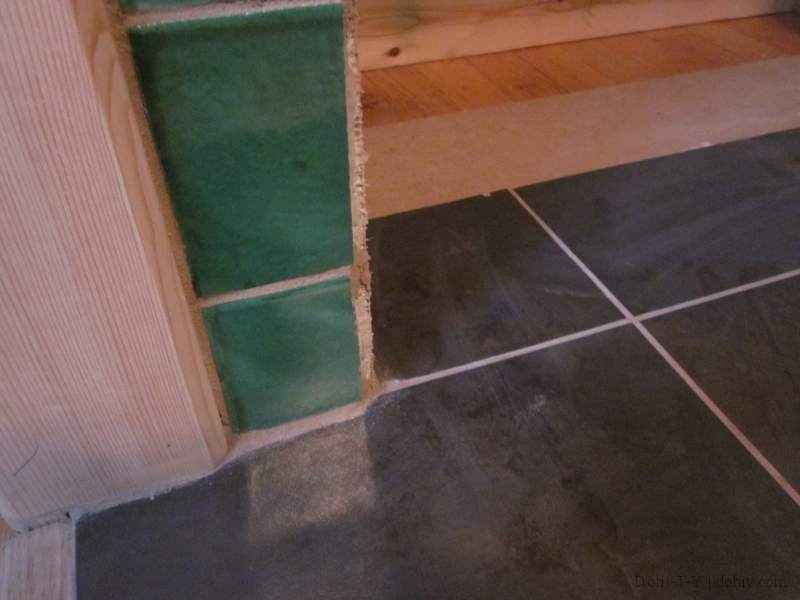 Hearth tiles stuck down to the hardboard and grouted. I routed some pieces of oak trim to fit around the tiles. The trim had a notch on the underside so that it would sit on the hardwood floor and lap onto the hardboard. Then the grout was applied. 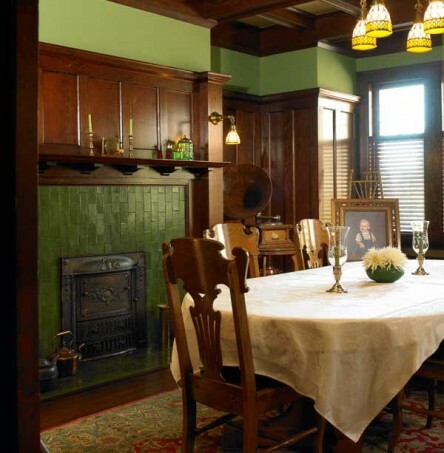 The result is a hearth that sits on top of the existing hardwood floor, without being attached to it. Its weight holds it down as if it were screwed to the floor. The fireplace is finished and ready for the fire and surround. Construction of the built-in is nearly finished! There are just a few finishing touches left to do. 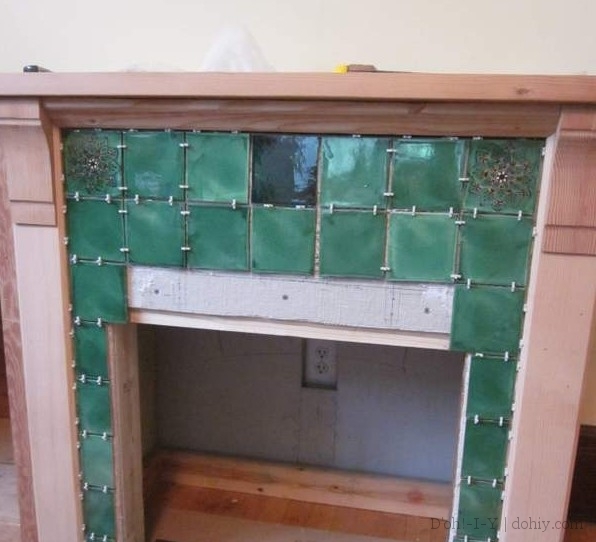 This entry was posted in Construction, Decor, Furniture, Walls & Floors and tagged arts and crafts fireplaces with green tile, tiling a fireplace, tiling a hearth, using handmade tile on a fireplace, using Mexican tile on a fireplace, wood trim for a hearth. Bookmark the permalink.